Blockchain-based smart contracts are considered a promising technology for handling financial agreements securely. In order to realize this vision, we need a formal language to unambiguously describe contract clauses. We introduce Findel – a purely declarative financial domain-specific language (DSL) well suited for implementation in blockchain networks. We implement an Ethereum smart contract that acts as a marketplace for Findel contracts and measure the cost of its operation. 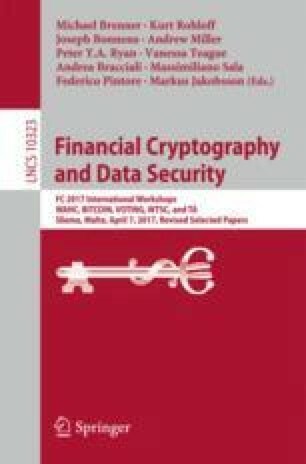 We analyze challenges in modeling financial agreements in decentralized networks and outline directions for future work (See the author’s post-print at https://orbilu.uni.lu/handle/10993/30975 and the related source code at https://github.com/cryptolu/findel). A fixed-rate currency exchange: the owner sells €10 for $11. A market-rate currency exchange: the owner sells €10 at market rate as reported by the gateway at addr. A zero-coupon bond: the owner receives $100 at \(t_0\). A bond with coupons: the owner receives $1000 (face value) in three years (maturity date) and two coupon payments of $50 at regular intervals before the maturity date. A future (a forward 15): parties agree to execute the underlying contract \(c\) at \(t_0\). An option: the owner can choose at (European option) or before (American option) time \(t_0\) whether to execute the underlying contract \(c\). A binary option: the owner receives $10 if a predefined event took place at \(t_0\) and nothing otherwise.